We’d walked a long way, from the famous bridge over the River Kwai into Kanchanaburi, the nearest town. Thailand had been hard work. Even the women who patiently and carefully watered the grass in the Allied cemetery were wilting among the stark white tombstones, each bearing a British name and a familiar place. We stopped at a small restaurant by the side of the road, little more than a shack with a few curries and some rice on the go. There were four vats, each holding a different curry. I pointed to the one on the left. The waiter shook his head and laughed. Too hot. More laughter too hot. No way a foreigner could eat that. Maybe, but still a note of derision. He grudgingly sold me the last one. I could tell in his eyes that he thought it might actually kill me. The curry was red, rich, hot. Very hot, but delicious. That’s my benchmark curry. That’s what Thai food should taste like. Nothing I’ve eaten in Britain has matched that curry, and I’m sure it never will, but few meals have even come close. 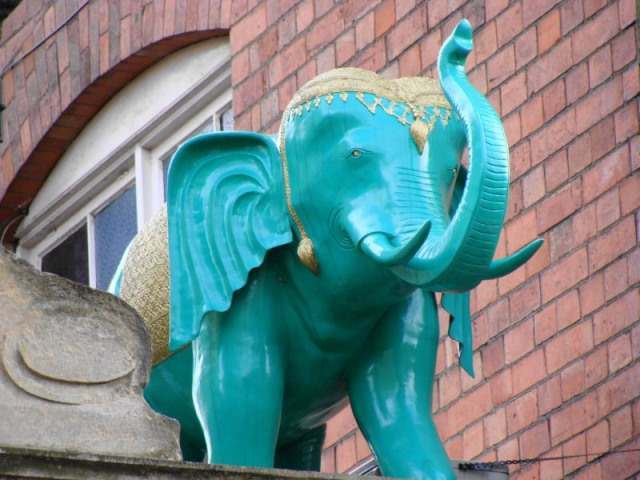 The Thai Emerald in Cheltenham was one meal that nearly made it. To start with, it looks the part, all intricately carved teak, gold everywhere, elephants over the door and silk dresses. It’s exactly what a Thai restaurant should look like. We started with a mixed platter of Thai starters. The spring rolls were fine, the spare ribs had been braised for a very long time and were soft and delicious, a huge skewer of king prawn, coated in breadcrumbs and deep fried was laced with coconut that gave it a sweet and unusual edge. Next a soup course, tom yum talay, a blisteringly hot broth with a mixture of seafood – mussells, carved squid, white fish. The soup had a fierce bite that attacked seconds after the sourness of lemon and lime had washed over the tongue. As a main course, there was gaeng daeng gai, a traditional Thai red curry, tender chunks of blanched chicken in a red savoury broth, cut with lemongrass and lime, flavoured with Thai basil and finished with the savoury pungency of nam pla, or fish sauce. The intense and angry heat of chilli was tempered by the soothing coolness and calmness of coconut milk. Baby aubergines, tiny balls floated in the broth, popping open in the mouth. The curry was sophisticated and complex, not as hot and edgy as the soup, more satisfying and comforting – a triumphant dish that left me only able to mumble something about it being ‘really, really good’ when my boss asked whether I was enjoying it or not. There wasn’t the atmosphere of that meal in Kanchanaburi, but how could there be? Food is often as much about context and experience as it is about taste, but this was a superb meal, prepared with skill and presented with care and attention. The photo is from Cheltenham Daily Photo – many thanks to Marley for letting me use it.